If Mitt Romney were president, all options for defeating the terrorist group ISIS would be left on the table—including boots on the ground in Iraq. On CBS' Face the Nation on Sunday morning, the former Massachusetts governor and two-time Republican presidential candidate gave President Obama some advice on executive leadership, telling host Bob Schieffer that the president was wrong to say he wouldn't consider sending U.S. ground troops in Iraq or Syria to fight the Islamic State. The terrorist group released a video Sunday reportedly showing the gruesome execution of another American hostage, aid worker Abdul-Rahman Kassig, previously known as Peter Kassig. "When the president says, for instance, that ISIS is a cancer and it must be eliminated, he's right," Romney said. "But you don't say, 'Well, we're only going to use the following tools in doing so.' You say, 'We're going to do whatever it takes.' And hopefully we'll be able to do that with other people's troops, but if it takes our own troops, you don't take that as a source of our strength from the battlefield." 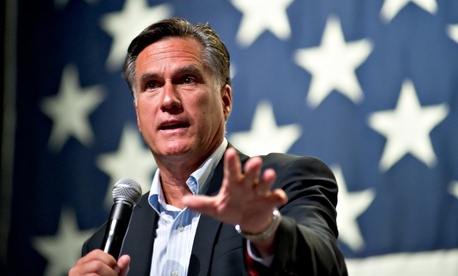 Since losing to Obama in 2012, Romney has been vocal about his foreign policy views. In that election, he repeatedly asserted that Russia was the U.S.'s "No. 1 geopolitical foe," a claim Obama brushed off at the time. But Russia's annexation of Ukraine's Crimean Peninsula earlier this year—and the subsequent tension between Washington and Moscow—made Romney's declarations seem all-too prescient. Romney also weighed in on domestic policy. He told Democrats to "take a breath," and advised the president not to go forward with promised executive action on immigration, to which Republicans are vigorously opposed. "What he's proposing to do is a temporary solution which would ultimately potentially be reversed by a Republican president," Romney said. "It's the wrong way to go. It doesn't help the people that are hurt by the lack of policy in this area, and it's going to set back, as opposed to bring forward, the needed reforms that the American people want." Romney, whose name has been floated in the last few months as a possible 2016 presidential contender—despite his repeated claims that he's not running—also gave a bit of advice to members of his own party in Congress. Shutting down the government, he said, isn't the way to go. "There are other productive ways to impress on the president the need to work for a permanent solution, as opposed to a temporary stopgap solution," he said. If he does run, Romney will have some ammunition against likely opponent Ted Cruz, the Texas senator who engineered last year's government shutdown. By positioning himself as the de facto leader of the Republican Party ahead of 2016, he could have the opportunity to weigh in not from Salt Lake City, but from the Oval Office. This article appears in the November 17, 2014 edition of NJ Daily.